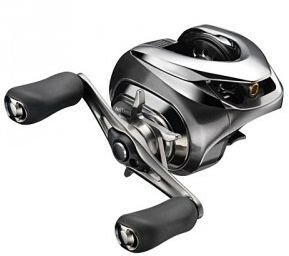 Shimano's high-end low profiled bait caster, Antares DC reels are debut. The list of following high-end fearture is to make Antares DC the smoothest, longest casting reel. It has New 4x8 DC computer controled brake system which senses and controls spool speed by 1/1000 sec. New Magnum Light Spool is machined to remove weight and acceralate fast. Micro module gears leave almost no gearing noise to hands. All of these features are housed in very sturdy aluminum Hagane body frame. Mr. Murata Hahime, a famouse angler contracted with Shimano threw 109m, 120yds with this new Antares DC with 3/4oz sinker and 7ft Shimano Shaura rod. He threw 99m with the previous Antares DC reels. 4 modes, FL: fluorocarbon line mode, P: PE braided line mode, NM: Nylon monofilament mode, X: extreme long cast mode. Please set one from these 4 to suite your line chosen. X should be chosen to cast the longest with heavier than 5/8oz rigs. Jun's comment: The reel doesn't have cast control caps. The DC brake does the all job and you don't have to adjust the cap. WOW. The reel actually have a cap inside the side cup, but it is not to adjust for casting, and you set the cap for spool to have no play side by side.